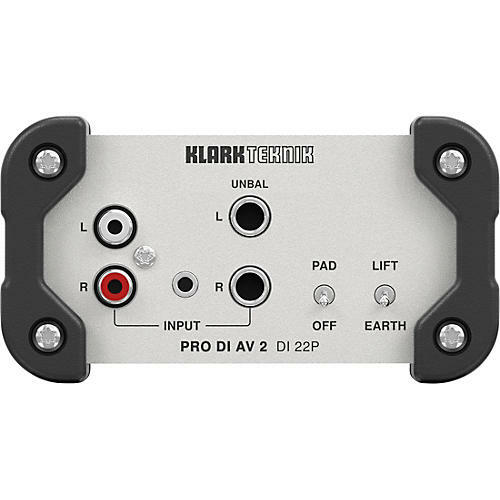 Building on KLARK TEKNIK’s storied legacy of highest-quality direct injection devices, the DI 22P PRO DI AV 2 offers the same high headroom, dynamic response and sonic clarity you have come to expect. DI 22P combines many of the outstanding features of the DI 20P and DI 10P direct boxes into one powerful tool that should be in every audio engineers kit. The extremely versatile DI 22P accepts dual instrument, line and speaker levels, plus also accommodates MP3, CD players, keyboard or drum submixers, and a variety of other stereo sources, and faithfully reproduces the character of electric and acoustic instruments, allowing far more of the detail of musical performances to be captured. A passive device, the DI 22P does not require any form of external power to complete its mission. Equipped with custom-built MIDAS transformers and switchable input Pads, the DI 22P is the perfect choice for premium-grade professional audio and multimedia applications.